Located in south central Kansas, Wichita is a city with a split personality. On one had it’s home to a thriving aerospace industry, and on the other it’s ground zero for cowboy culture and the old west. But there’s also another side to Wichita — a wild side. And I’m not talking spring break wild here, but lions, tigers and beasts wild. In fact you can you feed a lemur, cuddle up to a lorikeet, enjoy some face time with a gorilla, and get up-close-and-personal with a wild turkey — all within a 25-minute drive of city center. As an added bonus, all of the sites feature barrier-free access, which makes them excellent choices for wheelchair-users and slow walkers who want to explore Wichita’s wild kingdom. The brainchild of Jim and Sherri Fouts, Tanganyika Wildlife Park (316-794-8954, www.tanganyikawildlife.org) is located in the eastern suburb of Goddard. Although the wildlife park offers some great interactive experiences, the Fouts are quick to remind visitors that it’s also a premiere breeding facility for rare and endangered animals. Says Jim, “Our ultimate goal has always been the conservation of animals.” And you can see evidence of that in the overflowing nursery, when you first enter the park. Access is excellent at Tanganyika, with plenty of accessible parking near the entrance, level access to the front gate, and barrier-free pathways throughout the campus. You can of course enjoy the animals from afar, but save some time for the many interactive encounters that are included with general admission. For example, you can feed a reticulated giraffe, or wander through the lorikeet enclosure and offer nectar to the residents. And don’t miss Lemur island, where you can roll right up to the ring-tailed lemurs and give them a few treats. The park also has an accessible picnic area, so pack along a picnic lunch to feed yourself as well. As an added bonus, employees roam the grounds with some fun animal ambassadors. Seriously, how often do you get to pet a hedgehog? The Sedgwick County Zoo (316-660-9453, www.scz.org), located is east Wichita, also offers some fun animal encounters. As the seventh largest zoo in the country, it’s home to more than 3,000 animals. On the access front, there’s plenty of accessible parking, with level access to the front entrance, barrier-free pathways throughout the grounds and plenty of accessible restrooms. Truly you could spend the whole day at the zoo, however because of its size, some prudent planning is necessary so as not to miss some of the top attractions. For starters, there’s the popular Downing Gorilla Forest Reserve. A barrier-free path leads through the jungle to the door of this unique enclosure, where visitors are the captives and the gorillas run wild outside the glass walls. The gorillas aren’t shy either; in fact they come right up to the glass and stare down whoever ventures close. Tiger Trek, which is located around the corner in the Asia section, is also a must-see. As with the gorilla enclosure, visitors approach the building through a level forest pathway. Once inside you’ll get an up-close-and-personal look at the Amur tigers. Although not as active as the gorillas, they put on an equally entertaining show. Be on the lookout for the elusive red panda too, which can sometimes be found hiding in the foliage near the enclosure entrance. Last but not least, don’t miss the popular rainforest aviary, which offers level access, with paved pathways, hard-packed dirt trails and boardwalks on both levels of the building. The massive enclosure houses over 60 species of tropical birds, with benches strategically placed along the walkways. It’s a good choice for wheelchair-users as well as slow walkers, as visitors can stop and rest, or just sit back and enjoy the show. Keep an eye out for the feeder orange slices in the overhead branches, as that’s where you’ll also find a colorful collection of nectar loving birds. And if you don’t see something at eye level, look up, and you’ll probably spy someone eyeing you from above. For a look at some local wildlife, get ready to hit the trails at Chisholm Creek Park, located next door to the Great Plains Nature Center (316-683-5499, www.gpnc.org) in northeastern Wichita. There’s plenty of accessible parking in the large lot, with level access to the trailhead. There are also accessible picnic tables on the grass and accessible restrooms located nearby. This is the perfect place to see white-tailed deer, wild turkeys, great egrets and muskrats in the tallgrass prairie and wetlands habitat. Even better, all of the trails are wheelchair-accessible, so the only deciding factors are you stamina and your habitat choice. The Quail Trail is the shortest trail, with the trailhead located just off the parking lot. The half-mile loop is paved and level, and easy to navigate in a wheelchair. The .9-mile Heron trail branches off the Quail Trail, and includes a nice series of accessible boardwalks over the wetlands. The 1.1-mile Bluestem Trail branches off the Heron Trail and connects to the 1.7-mile Cottonwood trail. And if you’d like a little variety, you can make a large loop using a portion of each trail. Whatever you choose you can’t go wrong, as every trail in the park is wheelchair-accessible. Save some time to visit the Great Plains Nature Center too. There’s level access to the entrance with good pathway access inside Koch Habitat Hall. The center features exhibits about the surrounding grasslands, wetlands and woodlands, and it includes a 2,200 gallon aquarium filled with native fish. It’s an excellent primer on the native wildlife and their habitats, and a great prequel for any local hike. 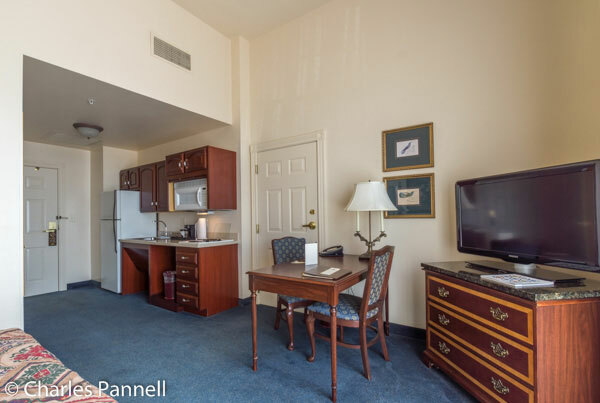 Of course with so many things to see and do in the area, you’ll want to stay a spell, and the Hotel at Old Town (316-267-4800, www.hotelatoldtown.com) is a very accessible place to hole up for a few days. Built in 1906, the building has been lovingly restored to its former grandeur, and although access wasn’t figured into the original building plans, it was a prime consideration when the property was renovated. Today this stately old gem exudes the charm of yesteryear, but it also includes modern access features. Accessible parking is available in the garage next door, with level access to the front hotel entrance, which is equipped with automatic doors. There is also an accessible drop-off area near the front door. There’s good pathway access throughout the lobby, with alternate ramp access where there are steps. Accessible room 133 is located on the ground floor, just around the corner from the lobby. It features wide doorways and good pathway access and is furnished with a 27-inch high double bed with wheelchair access on both sides (although a side chair may need to be moved). Other furnishings include a chest of drawers, a nightstand, a desk, and a table with two chairs. There’s also a small kitchenette with a refrigerator, a two-burner cook top, a microwave, a coffee maker and a good selection of dishes, pots, pans and utensils. 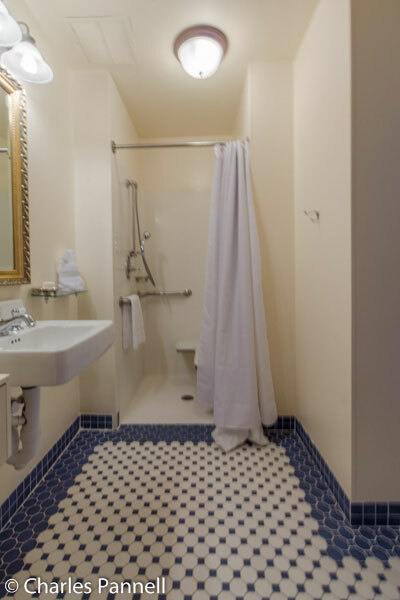 There is a wide doorway to the bathroom, which has a full five foot turning radius. It’s equipped with a 36-inch square roll-in shower with a fold-down shower bench, grab bars and a hand-held showerhead. 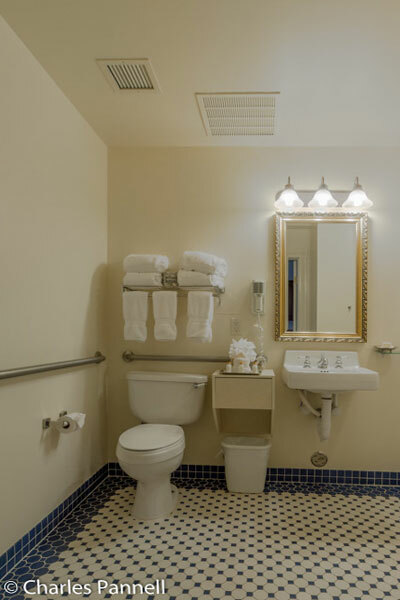 The toilet grab bars are located on the back and right walls (as seated) and there is also a roll-under sink in the bathroom. A buffet breakfast is offered each morning in the lobby, and there’s plenty of room between the tables to navigate a wheelchair. Additionally, you can’t beat the location, as it’s in the heart of Old Town, and within walking distance of a number of restaurants. 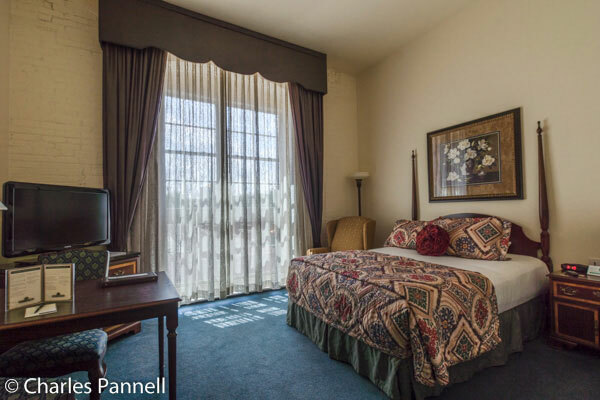 Comfortable, convenient and accessible — the Hotel at Old Town has it all.